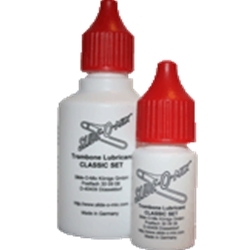 Slide-O-Mix Trombone Lubricant gives your slide a fantastic glide. It is a 2-component liquid lubricant, which adheres very well to the slide surface. There is no sticking or stopping of the slide. Slide-O-Mix is very economical in use. Very helpful, especially for beginners, is the fact, that no faults in dosing are possible. To meet all different dosing habits, you can get both components of the set also single. In some rare cases, i.e. for "problem"-slides, an even thinner gliding film is helpful. Therefore we developed Slide-O-Mix light. Slide-O-Mix is the lubricant of choice for many internationally well known trombone players and can be found in many well known orchestras. Note: By judgement of the health authorities in Germany, it is "non toxic for human beings and it is non irritant to mucous membranes". "No sanitary objections against this or against the complete formula exists."